Geek on a Bicycle (Blog): Near Death Experience: 1 of ? Near Death Experience: 1 of ? This is one of my favourite anecdotes - I've told it to so many people now, that I feel I may as well type it up to share with friends of the Geek on a Bicycle. In 2007, a group of three friends and I ventured out to Alaska on a two week Trek America trip which took us in a figure of eight circuit some way into the Alaskan interior and back down south again to the peninsula. As 19 and 20 year olds, we wouldn't have been able to travel the vast Alaskan highways in our own car. We went at the beginning of September which is traditionally the last good part of Alaskan summer. In fact, a week after we left it started snowing heavily. With a small surplus of cash from my summer internship, and in a photography craze, I had been lusting after the newly announced Samsung GX-10 D-SLR - this was a rebranded Pentax K10D but as Samsung's first SLR, discounted. Prices in London were pushing �450 but I held that camera in the back of mind. When we got to Anchorage, we stumbled across a famous camera shop - Stewart's Photo Shop. Amazingly, they had this camera in stock and with the GBP-USD rate being favourable, I walked out with the camera, an 8GB SD card and a case for under �400. Alaska treated us to some beautiful weather that first week and armed with my shiny new camera, I took three hundred photos in the first three days. Additionally, having geeked out before the trip, I had a second smaller camera, a mobile phone and GPS tracker which I kept on the go concurrently - taking a GPS track as went with the intention of geo tagging photos afterwards. On the third day, we rolled up to Maclaren River Lodge - a place that, to this day, is still my favourite place in the entire world. To get to the lodge, we travelled for a few hours off the paved highway down a gravelly mountain pass and over a deep ravine on a rickety wooden bridge. The lodge itself was beautifully built, run by an owner whose name eludes me. We visitors slept in a wooden bunk house and ate dinner in a warm and homely common room. Near to the lodge were kennels housing the owner's huskies - while unpacking our belongings we caught site of these Iditarod competitors in training as they pulled a quad bike along the road. On the night we arrived, the sun set in a hauntingly beautiful orange sky where the peach infused clouds rolled infinitely onwards in every direction. 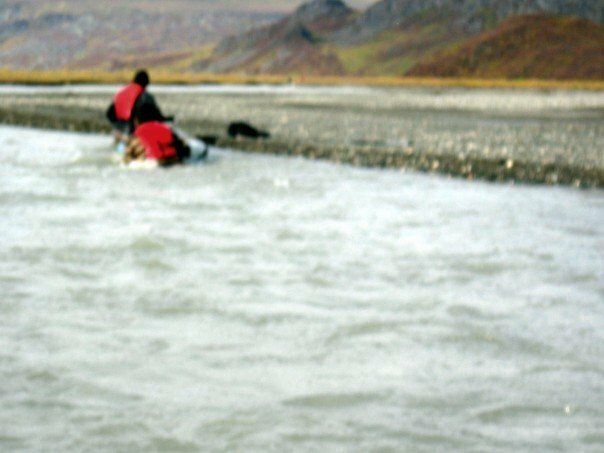 The next morning we took an aluminium gunboat out to a enormous plain where we would trek out to a glacier, attempt to touch it and then return by kayak. Fuelling the gunboat was an amusingly terrifying experience as our loveable lodge owner smoked a cigar with one hand and poured liquid diesel into the gunboat's tank. The trek itself was deceptively tiring, taking what seemed like forever to reach the glacier in the middle distance. Disappointingly, we weren't able to touch the glacier itself but I did grab a nice handful of its meltwater. The plain we trekked over was so far from actual civilisation that it was possibly the single most awe inspiring place I have ever been to. The feeling of being almost completely and utterly alone was sublime. In the spirit of our Alaskan adventure, my group of four friends and a couple of others elected to canoe back to the camp, a three hour paddle downriver versus a thirty minute boat ride back. By the time we returned to the river bank where we had first stepped off the gun boat, the rest of the group had left and the only sign of their presence were a number of upturned canoes and a pile of paddles. It was nearing early evening with the sun low in the sky and we had calculated that we would reach camp just as it became dark. The river itself was fairly shallow, but being so close to a melting glacier, was flowing fairly quickly. About five to ten metres wide, it was guided along by gravelly banks beyond which were summery meadows of metre high grass and the occasional bush. My good friend Aamod and I decided to pair up. We flipped our canoe, placed in on the surface of the water and slowly got in. There were two dry compartments - fore and aft. Aamod, being super wary of his gear getting wet had used up our camp's supply of plastic sandwich bags to individually wrap each of his possessions. He further extended this protection by locking his bag within the fore compartment. Despite having several hundred pounds worth of technology in my day bag, I failed to seal the aft compartment closed after placing my bag in there. As we pushed off, I was adamant that I knew the correct form for steering a canoe, having spent the previous year rowing at my university college. I thought that if we wanted to turn right, we should paddle on the left. Aamod, having been canoeing (I hasten to add - unsuccessfully) before, was convinced that paddling on the right side would accomplish this. In some ways, we were both right - except that instead of both paddling on the same side, one person should have held his oar up, to slow the boat down. We began our journey by meandering from bank to bank, arguing with each other over the correct steering technique and making little headway. Still, the river moved quickly and we were moving downstream at a respectable rate. Six minutes into the journey, our meandering took an unfortunate turn (quite literally) and we made contact with a ridge of gravel amidst the river. Were it the bank, we would likely have just bounced off and head back towards the other side of the river. Unfortunately, the shape of the mid-river ridge and the angle with which we struck it (and Newton's 3rd Law) meant that our canoe flipped over almost immediately. Aamod and I fell straight into the icy water, followed by my bag containing my two cameras, phone and GPS tracker. My immediate reaction to this was to swear as loudly as possible. Having heard our cries and the considerable splash of two overweight (at the time) young men falling into the water, our friends turned around. Amused, they laughed and took photos. It was no laughing matter however and with the river speed pushing 17 miles per hour (a fact revealed by the six minutes of GPS data I had captured and was later able to analyse) it was a struggle to even stand up in the shallow river. After much fumbling of our feet, Aamod and I managed to hold our positions, with me holding the paddle in my right arm and the boat with my left upstream and Aamod standing downstream of the bow of the boat. The next step was to try and flip the boat to its correct orientation. This in itself was remarkably easy but as the corrected boat gained a V profile in the fast moving water, it began to accelerate downstream. Unfortunately, Aamod was standing downstream of the boat and as it picked up speed, it continued at pace into his crotch. I was still holding the rear of the boat but Aamod, now in considerable pain, pitched over and let go of the front of the boat. With Aamod's crotch now no longer stopping the boat from moving downstream, it continued with the water and pulled me along with it. With my boots struggling to gain any traction on the riverbed, I flipped the canoe in an attempt to get it to slow down. This helped and I was able to stop the canoe from moving as quickly as it was but this left me in an undesirable position, trapped under the boat in an air pocket that was quickly filling up with water. The boat continued to move with the water and whilst I tried to dig my heels into the gravelly floor of the river, the force of the river was too much. Realising at this stage that I could very possibly drown if trapped under the boat for much longer, I jumped up with all my might and pushed the boat up and over to the side. The water quickly took hold of it again and carried it off away from us. By this point Aamod had begun to make a move for the damned ridge in the middle of the river and I did the same. Crawling up onto the ridge, we were both soaked and quickly started shivering. Luckily we were the penultimate canoe in our group and the last canoe pulled over as soon as they saw us. I don't remember much of the next three hours except that it was extremely cold and it quickly grew dark. One of the two canoeists who pulled over was a retired high school English teacher called Buzz who told us about how he had once travelled to London, on a trip to Europe in his early 20s (in the 60s). I can't imagine how different it must be now. He also showed us his photos on his SLR and mentioned that he had almost run out of space on his SD card and would soon buy another to put photos on - since he didn't own a computer. Wow. I couldn't help but laugh at my misfortune with my D-SLR while we waited for help. As it became dark, Aamod and I started getting colder and colder. We sheltered under the upturned canoe. Our clothes refused to dry with any sort of speed and the ridge itself, being about 10 feet long and 3 feet wide, didn't offer enough space to move and generate heat. About three hours later, we heard a distant droning noise. Help, we hoped. The shiny aluminium gunboat grew closer and perched on the bow of the boat was the lodge owner's husky - nose out and searching for us. The lodge owner piloted his gunboat, cigar in mouth and with a concerned look on his face. Next to him was our tour guide. Hanging out of the rear of the boat was our canoe and paddle. They pulled up, wrapped us up in some warm blankets and fed us some watery instant hot chocolate. The journey back was a blur - under the dark night sky, the banks of the river became indistinguishable and I wasn't in any sort of mood to pay attention to anything but getting warmer. Soon the lights of the lodge appeared in the distance and before we knew it, we were home, having missed dinner and having been excused from having to do the washing up! I was relieved to hear that my bag had been recovered - trying to get a police report to verify that I had lost my camera for the insurance company in the middle of the Alaskan outback would have been a very difficult task indeed. The rest of the trip was beautiful but I have no photos of my own of the places we visited. I'll go back one day and continue the canoe trip - although this time I'll both waterproof my gear and perhaps agree with Aamod on how best to steer downstream :-).